Macaroni and cheese just may be my favorite food. And I’m not alone. Mac and cheese consistently ranks as America’s top go-to comfort food, hands down, and we make it in countless iterations, with all manner of pasta shapes, types of cheeses, mix-ins and toppings. I’m a traditionalist, though. I don’t like it fancy. And I especially don’t want bacon anywhere near it — not in it, not on it, no how. No bacon, you say? I know. I’m a shame to my people, a traitor to my southern roots. But I just don’t love bacon. (Please don’t hurt me.) 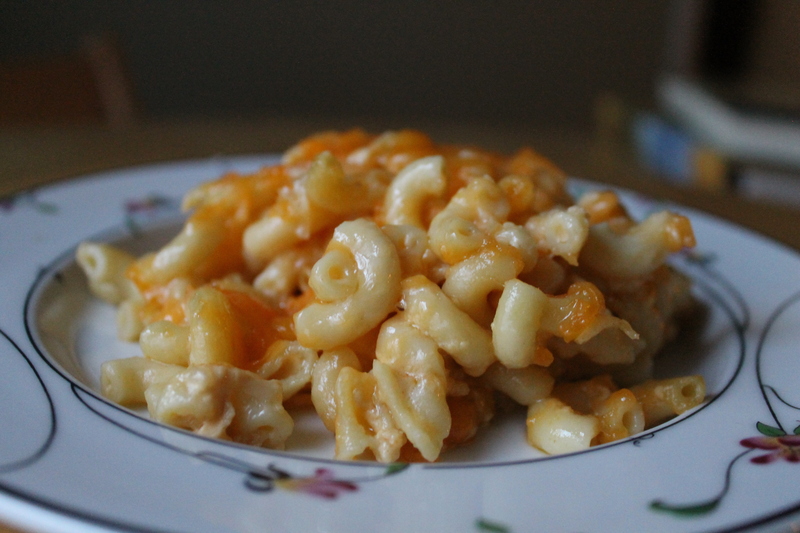 And when it’s added to mac and cheese, the flavor just takes over and permeates everything. Some of you are wondering what’s wrong with that. On mac and cheese, I’ve found that there are two schools of thought. One submerges macaroni (or any manner of small pasta) in a creamy, cheesy white sauce with roots in a butter-flour roux. 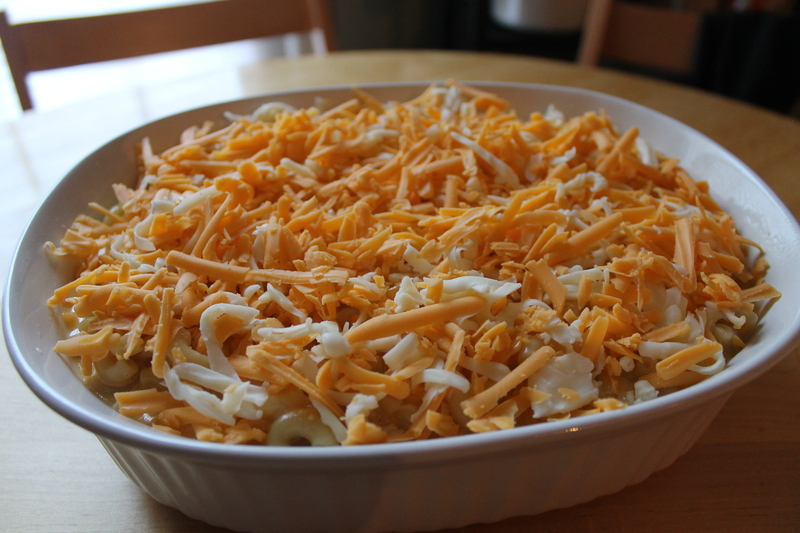 Then there’s the southern way — layering pasta with cheese and pouring over an egg and milk custard. 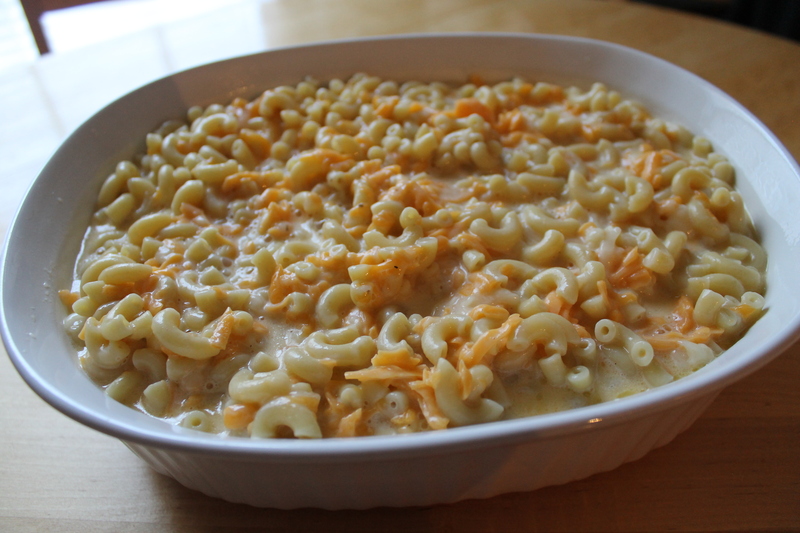 I grew up eating this version, where the mac and cheese bakes into a solidified, though delicious, mass that you can cut and serve in a perfect square. To me, that was always true and traditional. 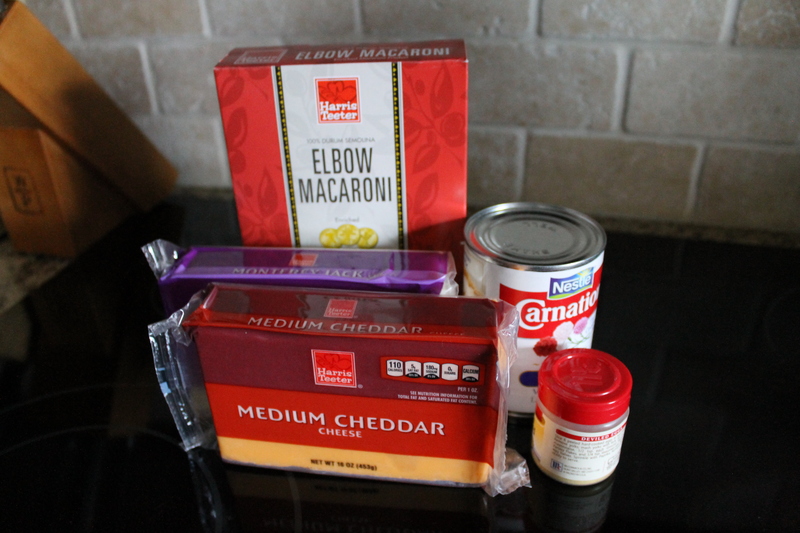 Lately, though, I’ve been on a quest for the best macaroni and cheese recipe. I don’t tend to care much for mac and cheese made with the butter/flour white sauce base because it’s never properly cheesy enough, and I can all too often taste the flour. Just, ick. The southern custard version has its issues too, especially when there’s not enough cheese or it’s not mixed well. Then it’s dry and way too egg-y. Also, ick. The good news is that I’ve found the perfect compromise — I don’t use either. No white sauce, nor custard. I’m a renegade, right? Rather, I’m a convert to my aunt Taffy’s recipe (that’s Jessica’s mom). She discovered it in this gem of a local church cookbook and brought it to one Christmas dinner. It changed my world, at least in terms of mac and cheese. Plus, we all now own that cookbook — most of the amazing, runaway hits at our family gatherings come out of it. It’s also incredibly easy, you can source it for a crowd, and it’s ridiculously good. The secret ingredient is evaporated milk, which provides the creamy element but isn’t heavy like either a white sauce or a custard. It allows the main ingredients we love, the ones we really came for — the pasta and the cheese — to shine. Preheat the oven to 350° F. Grease or butter a 13×9 inch baking dish. Cook the pasta in salted water (just throw in a teaspoon or so of salt when it’s boiling) until it’s al dente. For macaroni, which cooks 9-11 minutes, that’s only 9 minutes. While the pasta’s cooking, shred the cheeses. Cook’s note: freshly shredded cheese is very important! For one, it melts better. And two, have you ever read what they put on pre-shredded cheese? At the best it’s cornstarch … which is still icky. At the worst, it’s …. well, let’s not think about it. When the pasta’s ready, drain it well in a colander, then add it back to the warm pot it cooked in. Add the butter and stir until it’s melted and the pasta is coated. Set aside a heaping cup or so of cheeses, then add the rest to the pasta. Pour in the can of evaporated milk. Fill the can halfway with water, and add that to the pot too. Sprinkle in the salt, pepper and dried mustard. Stir everything together. If it looks a little soupy, that’s okay. If it’s dry, add more water, just a tablespoon or so at a time. 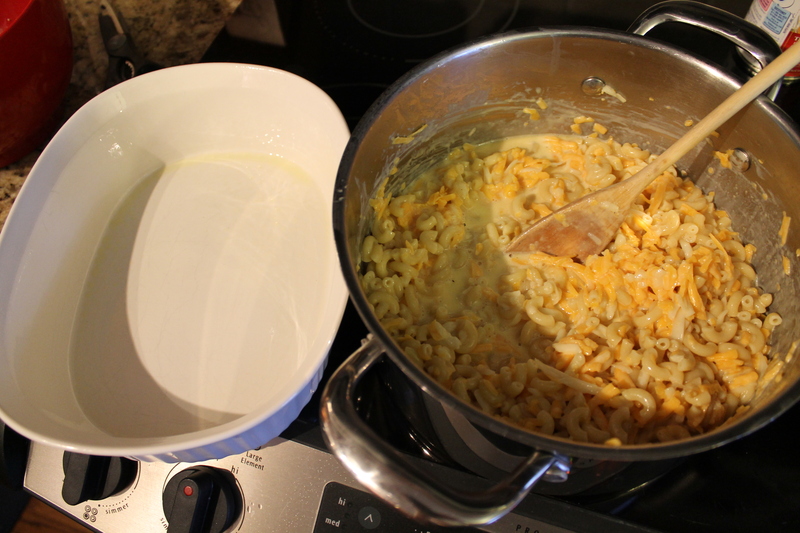 Pour the macaroni and cheese mixture into the prepared dish. Top with the remaining cheese and cover with tin foil. Bake in the oven for 20 minutes. Then remove the foil and continue baking for another 15 to 20 minutes. Let it stand for about 5 -10 minutes before serving. Oh my, this looks good. I too have a weakness for mac and cheese. I will have to try this soon. Hi Christy! Please do, and let us know what you think! Can not wait to make that!!!! are not really a lot more smartly-liked than you might be now. except it’s something to do with Woman gaga! Your personal stuffs great. Ich habe alle, die so gelesen zu diesem Zeitpunkt mich auch zu kommentieren hier.